So when Michelle Obama gave a trajectory of hope in American today and insisted that a leader must give hope: my question is how can Donald Trump give hope to more than half of Americans who he has made invisible to himself? “If I was starting off today, I would love to be a well-educated black because I really do believe they have the actual advantage today.” – Donald Trump attacking affirmative policy in an NBC’s two-hour special “The Race,” by host Bryant Gumbel. In a recent interview with Oprah Winfrey, the first lady of the US, Michelle Obama, reflected on the place of hope in society, following the US election. But because truth and fact have both become parts of the casualties in the American election, Donald Trump and Trumpsters have twisted Michelle Obama’s poignant rendering of where Americans and the world are with Obama, and the challenges ahead. Because of the usual distortion of Trump and Trumpsters of serious issues of history, let us place Michelle Obama in context in order to see how Trumpsters will use a one line tweet here, another phrase there in a rally to manipulate history, truth and fact. “Oprah Winfrey: Your husband’s administration, everything, the election was all about hope, do you think this administration achieved that? This is how Donald Trump, responded to Michelle Obama. Remember that Trump and the Trumpsters bad mouthed all American institutions, and called them rigged just before the election when he felt he was going to lose. Someone who saw nothing good in society cannot be a source of hope. Now read more about what Michelle Obama said and make your judgment. “Oprah Winfrey: When you said it was not done for your husband, for his presidency, what do you mean by that? “Michelle Obama: There were people who did not support his presidency. There were people in Congress, leaders in Congress that did not support his presidency, which was not something that was good for the country, it was good for politics, but it was not good for the country. “Oprah Winfrey: Was there a time when you thought this period was going to break you? When did you feel the most tested? “Oprah Winfrey: There seems to be something that happened to you during this particular campaign, I think it was in New Hampshire. There was a level of urgency and dynamism that we had not seen before that seemed to be coming from a different space that was not just political. “Oprah Winfrey: You felt you were shaken to your core. 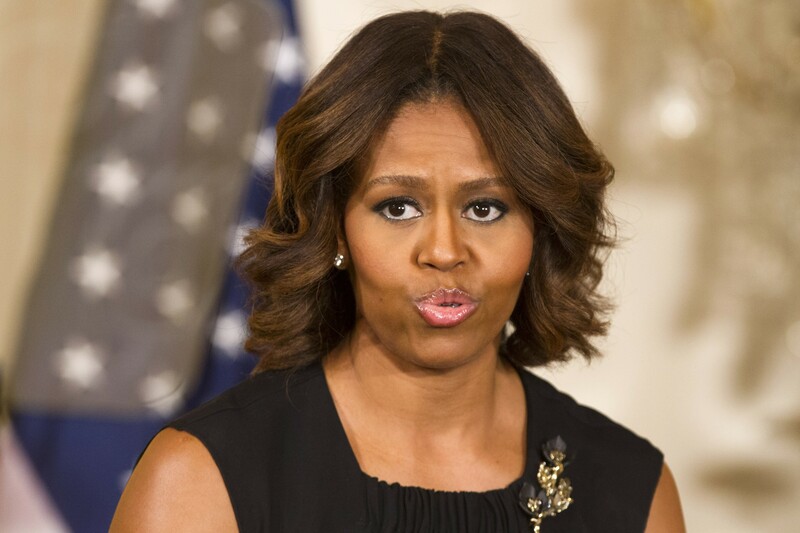 “Michelle Obama: Yeah a lot of people were shaken to their core. And still are… they are still feeling the reverberation of that kind of caustic language. What Michelle Obama meant here was simple. History has recorded the fact that Republicans in the American Senate and House of Representatives openly said that they would make sure President Obama did not succeed when he took office eight years ago. They blocked his programmes for eight years. And these Republican members of Senate and Congress maintained this position because of the president’s African American race. And on hope, there is a philosophical import to FLOTUS Obama’s account of hope. By asserting that it is a necessary concept, philosophically speaking, Michelle Obama was saying that you cannot contradict hope – as Donald Trump and the racist and bigoted forces backing him are doing – and still have a society. Given the status of “necessity” in thought, Michelle Obama’s claim is pretty straightforward philosophically. One does not need to be a rocket scientist to see this. So when Michelle defined hope as a necessary concept to have in a society, and Trump and the Trumpsters jump in to attack her, they miss the point. They fail to see the impoverishment of society, of neighborhood and public lives in America, given the prevalence of hate, bigotry and racism as reported in American neighborhoods, schools, churches, groceries, etc. To deny this – as Trump and Trumpsters do – is to live a post-truth and post-fact era, where facts and truth do not matter, with the one line tweets of Donald Trump actively twisting facts. Michelle Obama’s assertion that “words matter” strengthens her account of hope as a necessary concept, which gives society its meaning. Because “words matter” and “hope is a necessary concept” personal experiences and memoirs become legitimate ways of properly understanding what is at stake, because personal experiences and memoirs move things beyond the abstract. These personal experiences cut across African American and black communities. In other words, they are not special or peculiar to my family or me. These experiences of struggle, hard work and struggle for excellence in the face of material and deliberately inflicted psychological adversities by a section of the American society are the same. It was one of my students – an African American in a top research and medical school in the US – who first called my attention to Donald Trump’s words: “If I was starting off today, I would love to be a well-educated black because I really do believe they have the actual advantage today.” My student felt a deep moral and intellectual frustration at this racist claim for two reasons. First, consistently she was the leading student in her high school. I also know that she was a top student as an undergraduate because I taught her. She got into Cornell University, where I teach with highly competitive test scores. Now she is a candidate in a highly competitive and selective MD/PhD programme in the country. Second, she and her family are deep in debt like all American students, as a result of education loans. These two facts are not features of a person who got what she has because of her race. These features do not conform to Donald Trump’s words. Yet in Trump’s statement, he is saying that all African Americans and African American students (including my own African American children, whose doggedness and commitment to their education, community and church I know, and whose academic excellence and moral values their community and church recognise and have rewarded not because they are blacks) get what they get because of their race. Because “words matter”, as Michelle Obama subtly observed, and because racism, bigotry, xenophobia, sexism are mortal sins, and leave deep scars and deep negative psychic effects, permit me to end this on a more auto-biographical note. On a cold and wintry Saturday morning, I woke up with a jerk at about 7.05am. We live in the North East of the US, and unknown to me and my family, our city had just been pummeled by snow. Our three high school daughters (the youngest is 15 years) volunteer in our local hospital. Based on their schedules for the day, they must be in the hospital at 8 a.m., and this was 7.05 a.m. Frantically, I ran to their rooms to wake them up for they slept very late. Now, they had just 50 minutes to dress up and get set. No question. These girls did. That is the way their mom and I trained them. They are African Americans; they are black children; they must “jump six feet” to get what they want. Mom and I have accepted that reality, and we train them that way. The children have accepted that reality too – they must “jump six feet to get what they want”, even if others are jumping two feet to get the same thing. By 7.50 a.m. we ran out to the car only to be met by a neighbourhood drenched in heavy un-passable snow. We did not put on our snow boots before we rushed out of the house for we did not know snow had fallen. We did not check the weather. I wore slippers! My daughters did not look back. They did not go back to change to any snow boot. They did not complain. They are blacks, so they must “jump six feet”. They were focused on the time – they had to be at the hospital at 8 a.m. to volunteer. As I dug my feet in the snow with just slippers on, they followed me in tow. One shouted, “Papa don’t fall”, to which I replied: “I will not, just follow me”. We ran into the car and drove slowly – the winter driving style. On that day our neighbourhood was quiet because it was covered with snow and not many people had woken up. Yet these are the same blacks Donald Trump said get what they get “because they are blacks”. I have been stopped in a friendly manner by neighbours who were curious and asked why our lights are permanently on throughout the night. And I tell them that my children are studying. These are high school students. Transfixed, I saw nothing but shock on the faces of these neighbours. I often wonder why. But these are the same African American children, black children, who do not match Donald Trump’s description. My wife and I have been asked about our children’s education. As high school students, our children read as if they were in the university doing research. Their hard work is visible, and legendary in our neighbourhood, hence they are objectively rewarded by competitive schools, and not because they are blacks. Yet Donald Trump wants my wife and I to believe that our children get what they get because they are blacks! My children are not “special” African American children who are different. It is divisive, condescending, contemptuous and hateful to say that. Rather they are like other African American children struggling and working hard to put away deep scars of centuries of racism and bigotry, and new wounds of racism and bigotry in the United States of America. Yet Donald Trump, and the racist, bigoted and white supremacist forces backing him (such as Ku Klux Klan, alt right, sections of the Republican Party and the Tea Party, their media Fox News, Breitbart News) will look at every African American child who is doing well and say they get what they get because they are blacks. Fellow Americans who said at workshops that they were racists until they met my family have rattled my wife and I. Though such remarks are hateful, contemptuous and condescending, my wife and I “must jump six feet”, cope and handle it gently because we are blacks; we are African Americans. Perhaps like Michelle Obama’s mother taught her, my wife and I develop (especially my wife because she is an African American woman who must suffer this at another layer and level) instant amnesia about such statements in order to move on. But because racism, bigotry, sexism, xenophobia, anti-Semitism, homophobia are mortal and psychic sins, we the victims handle them differently. But my wife and I belong to the same African American race – the race Donald Trump said gets what they because of their skin colour. If my African American children have to “jump six feet” to get the same thing others have to “jump two feet” for, why will Donald Trump (who started his business with his father’s inheritance and whose children are – as being alleged in the newspapers – monetising the presidency of the United States of America for profit through private businesses) continue to say that if he were starting off today, he would love to be a well-educated black because he really believes blacks have the actual advantage today? If Donald Trump’s children are already monetising the American presidency and are seeking to turn the institution into a business enterprise, as being alleged in the media, isn’t that the real advantage? Or is it that the advantage Donald Trump and his children enjoy – and are allegedly trying to monetise the presidency, which is the collective moral estate of all Americans – because of their looks is justified? We need some candour here. Or are we in a post-hope, post truth, post-fact era in the United States of America such that we are so divided and half of us progressive America see these things as they really are, while the rest Republicans do not see these things because they do not want to see them? Henceforth, the whole media are in top gear trying to normalise Donald Trump – the great divider of the nation – while wondering whether Donald Trump can unite the country. But the real question will always be: how is it conceptually and practically possible for Trump as the great divider (who said, “If I was starting off today, I would love to be a well-educated black because I really do believe they have the actual advantage today”) to unite a multi-racial, multi-ethnic country? Words matter. Michelle Obama is right. Hope matters. She is right. Words are the oil with which we nourish hope.